TK102 fake or clone setup failed? This quick guide for TK102 will make your GPS tracker working with a tracking platform. Attention, this setup guide is related to a TK102 GPS tracker fake clone with digits 2704 in the IMEI number. If you dont have that digits in your IMEI you own another tracker, maybe coban, another clone or a genuine XEXUN tracking device. Check out our article how to recognize a TK102 clone, fake and original genuine before you do something stupid. There are a few other models which contain the digits ***22704 in the IMEI number, usually (but not always) starting with 355 (35522704*). 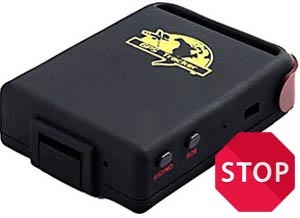 If your GPS tracker does not respond to the commands below or responds "fail" try our article alternative TK102 or GT02A clone setup for GPS tracking server. As usual we use 123456 as default password. If you have changed your password in the past please adjust following commands. If you use our FREE GPS tracking server you need to setup 0 (zero) as default timezone. Our server software will add your local timezone automatically. Do you know how much data your GPS tracker consumes? Learn more about data traffic and costs in our article FREE GPS tracker sim card in UK. If you have further questions or problems with configuration guide above please inform us. You can send us an email to the email address mentioned in our website contact and imprint.